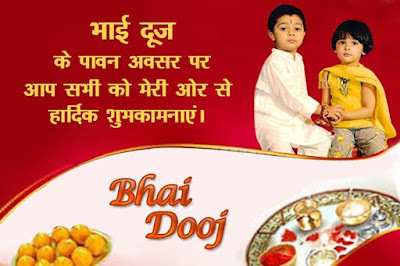 Happy Bhai Dooj Date in India 2019: Bhai dooj is the festival that comes during Diwali and it is celebrated all over India and Nepal, it is celebrated on the second day of lunar paksha in the month of kartika according to Hindu calendar. Bhai dooj is the festival that is celebrated especially in the entire north India, mostly it is celebrated by Awadhis people in Uttar Pradesh and Maithils of Bihar and also from people all over the country. This festival is known as ‘Bhai Tika’ in Nepal, and it is regarded as the most important festival celebrated after Vijaya Dashmi, which is celebrated on the third day of Tyohar festival, it is mostly celebrated by Newari people and also by Tharu, Bahun and Chetri people. In some places it is also known as Bhai dooj in Nepal. In the state Bengal, it is known as Bhai Phonta and also it is celebrated every year on the first day or second day of the Kali puja festival. It is also known as Bhau Bij in the state of Maharashtra and Marathi people celebrates it with great enthusiasm, and also widely celebrated by Kokani people. It is also known as ‘Yamadvitiya’, after legendary meeting of God of death Yama and his sister. In Hindu mythology, it is said that after destroying devil Narkasur, Lord Krishna paid visit to his sister Subhadra who gave him a very warm welcome and also flourished sweets and flowers on his grand welcome. She also applied Tilak affectionately on Krishna’s forehead. And hence this was the origin of the festival. On this day sister invites her brother at her home and also prepares her brother’s favorite dishes and sweets too, this whole scenario defines how brother always defends his sister and his sisters blessings are always with him. Afterwards a grand thali is decorated which is known as ‘Thali of Aarti’ this Aarti is prepared by sisters for her brother, carrying the rituals forward sister performs Aarti and applies Red Tilak on her brother’s forehead. This tika ceremony shows how sister always prays for her brothers success and also for his successful life, and also prays to god to give all the happiness to her brother all over the life, this ceremony symbolize love and affection between a sister and her brother, it shows and unending love and affection between a sister and brother. After getting lots of love from sister, brothers in return give their sisters gifts and also treat them with cash. In Maharashtra and Haryana, girls who don’t have brothers perform Aarti in front of the Moon God, and also applies mehendi on their hands as their tradition. The sisters whose brothers are living far away from her writes a letter for her brother that shows love and care for him, and also they perform Aarti in front of Moon God, that’s why people in Maharashtra affectionately calls Moon as ‘Chandomama’, (Chando means Moon and Mama means mother’s brother). It is necessary that both the brother and sister should be at least of age 5 to celebrate this festival. This festivals is very much popular and famous in Haryana, Maharashtra, Gujarat, and Goa. In this regions it is celebrated with great dignity and enthusiasm by following each and every rituals and traditions. Also Bhau Bij is festival that bring or makes reunion of all the families as it brings brothers and sisters together also friends and close relatives are also invited to celebrate this festival and make it remarkable. Special dishes are prepared in Maharashtra like basoondhi, rabadi, kheer poori, palak puri, all these delicious dishes are prepared on this day by sisters for their brothers. Whereas in Nepal, Bhaitika is celebrated in unique way, on this day sisters pray to God Yamraj for their brothers long and healthy life, also sisters put seven colored long time on the forehead of brother. In some places in India, it is traditional way that sister invites brother to her home after her marriage and when he comes to her home she asks him to seat on design made up of rice, then she performs Aarti and offers him rice, dal and curd to eat. It is also believed that it is lucky to see the kite flying in the sky on this day to fulfill the wishes requested by sister to God for her brother. Bhai Dooj is the festival when brothers and sisters remember their responsibilities for each other. It reunites and renews the love of brothers and sisters when all the members of family comes together. The festival brings lots of love and happiness in each home because it also shows respect between a brother and his sister. This festival is very special for sisters because when a girl gets married she has to leave her home and family back to get settled at her husband house, she always misses her family and her brother too, so when this festival arrives it is very happy time for her to welcomed her brother who is coming to meet her after a long time and also she has opportunity to prepare food for her brother and also to make his favorite dishes. If a brother is going under some personal problems or facing some issues since a long time, and having difficult times then on this day sisters keeps a ‘Vrat’ for her brother so that he will get rid of all the problems that he is facing, during the ‘Vrat’ sister don’t take food for whole day till the Aarti is perfomed in the evening, so after the Aarti is performed in evening she finally takes the food, such a big sacrifice is given by sister for her brothers successful life. In this way the beautiful festival of Bhai Dooj is celebrated that shows love, bonding, caring, and affection between a brother and his sister. It also strengthen the bond between them and also realizes them the importance of their relationship.